Engaging with subscribers can be daunting. Do you invite your email subscribers to reply to your email campaigns, blasts, and newsletters? If so, you can get the most out of those replies by routing them through Gmail. Then using the following four tools to create a great follow up experience. It’s impossible to know every one of your subscribers personally. But thanks toRapportive, a free tool for Gmail, powered by LinkedIn, you can get to know some of them before you start a conversation. When an email subscriber replies to one of your emails. This tool will see if their email address matches a profile on LinkedIn. If it does, it will give you the following information. You can use this to get to know your subscriber right from the start. It’s great for sales profiling, as you can pinpoint your email subscribers pain points and needs and include them in your first reply to them. When you reply to someone, do you wish you knew when they read your reply, when they clicked on your links? How about how often they opened your email, and so on? If so, Yesware is the solution. This tool, which works with Gmail and other email services, offers a host of features, including the ability to see how your email subscriber interacts with your reply to their email. This means no more guessing. No more sending a “Did you get my last email?” email. No more sending a “Did you read that report I sent you?” email. You’ll know what they did, when they did it, and based on that information, what your next response should be. Whether your inbox doubles as a to-do list or you simply don’t want to forget to follow up with a specific email subscriber. Boomerang is a great tool to use. It will allow you to send an email while simultaneously setting an option to send the email back to your inbox if you don’t receive a response, if the email is never opened, if the email is never clicked upon, or regardless of what happens. It’s simple, yet effective when it comes to making sure that your most important email conversations don’t just fade into the nothing. When email subscribers reply to your emails, do you find yourself responding with the same thing over and over again? If so, Gmail has a feature in their labs that will help you out. It’s called Canned Responses. You can activate it by going to your Gmail Settings, clicking on Labs, searching for Canned Responses, and then enabling them. The next time you find yourself writing a common response to an email subscriber. (or anyone, for that matter) You can save it as a Canned Response using the options in the dropdown menu at the bottom right of your email composer. Just be sure to change any personal items (like names, websites, phone numbers, etc.) as needed in subsequent emails. The best reason to use Gmail is for its Advanced Search capabilities. You can refer to this full list of advanced search operators for Gmail for all of the search options you can use to find specific emails from specific subscribers for specific reasons. This will allow you to do things like dive deep into conversations you had with an email subscriber. That eventually turned into a customer several years down the road. They will be extremely impressed that you remembered them from the first time they contacted you with a simple question that you just happened to find with an advanced search query. 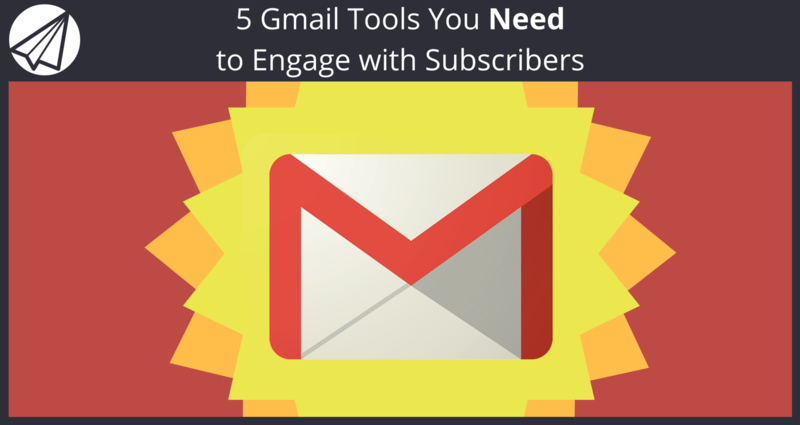 What tools do you use to make responding to email subscribers more productive and beneficial? Please share in the comments!